It sleeps up to 17 (+ 1 dog, so I could take Maizie along). It’s a holiday rental now, too. You can see what the real interiors of Fern Cottage look like here. This shot of the Northcott Beach House perched at the top of the cliff reminds me of Rie’s farmhouse that I showed you recently (but hers was in North Carolina, a long way from Cornwall!). Visit Unique Home Stays for more photos and information about renting Northcott Beach House for your next vacation (and maybe consider taking me with you!). Absolutely love this! Love the design, love the stripes, love the simplicity! Well very sorry you are sick. Not fun at all. Our spring break is next week. I’ll surprise you. Don’t hate me. Love this house. I have that coffee table in the first photo, the exact one! That cottage does look ideal. However, the weather in Cornwall is very changeable. My husband won’t go near there anymore, having spent 2 weeks when the children were small being soaked to the skin looking around cute villages, or sitting on the beach wrapped in several towels whilst eating sand-specked sandwiches. But it is very beautiful, and I’d go back in a heartbeat, particularly to that little place. It’s decorated exactly as a seaside cottage should be. Feel bettah, Julia! TY for sharing this quaint house! There’s a reason why, when I’m at Barnes + Noble, I often buy the British home magazines! I adore this charming cottage. It does look a little chilly, as Cindy mentioned. I didn’t expect to love this place so much, judging from the outside. I find the perfect symmetry a bit bland. But the interior….sigh….perfection! I always enjoy your blog and especially your visits to the west coast of England. I was fortunate to go on holiday to Devon one summer and we ventured to the town of Clovelly. It is a must see quaint town! I’m in! Though from what I’m hearing, it’s awfully cold now in England, too. August, maybe? Hope you’re feeling better. Ahh. Julia! Thank you for another trip to Cornwall. Someday it will be my favorite vacation spot! Sometimes simplicity is better than any luxury! Thanks for these nice photos! The exterior’s a little weird and stark, but the interiors are very fresh and pretty and that setting can’t be beat! 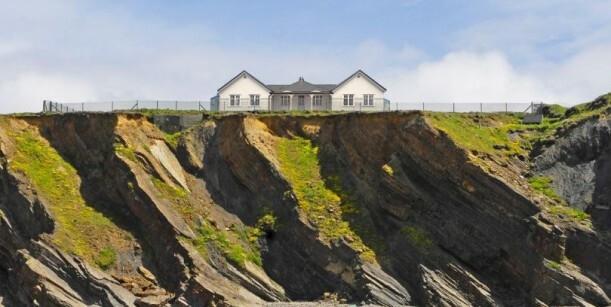 Its very cold here in the west country ….and if we get any more rain ..it maybe the bottom of the cliff house !! This is lovely- so restful. Do you read Rosamunde Pilcher’s books? (The Shell Seekers and Coming Home are my favorites.) She loves Cornwall and many of her characters live there. Very gentle, yet realistic home loving books. It’s a bit too countrified-granny for my taste. However, that is what makes the world go round – different preferences and styles which make each space unique. However, the view is amazing! What a wonderful sight to behold each day. This is lovely! I love the pops of red and the old-world country charm. I would love to spend time in this quaint part of the world. Hi Julia this I love everything about it looks welcoming. Doc Martin finished here last week to my great disappointment. We do have a lot of British shows here I confess I must watch them all just to see their homes and village street scape beautiful. Thank you for sharing. Hope you and your family have a beautiful Easter and I hope you are feeling better. Regards Esther from Sydney. What a wonderful vacation spot! Like others I love the country charm. I could see myself relaxing here and never wanting to leave. There are a lot of different patterns going on in the house but somehow it works beautifully. Really cute house. Sorry you’ve been sick, Jen! Hope you feel better soon.